The Laureate load cell or microvolt input transmitter is designed for use with load cells, strain gauges and microvolt input signals where exceptional sensitivity and stability are required. A most sensitive full-scale input range ±20.000 mV can be scaled internally to ±99,999 counts. The selected input range for the full 0-20 mA output span can be as wide as ±99,999 counts or as narrow as 150 counts, limited only by considerations of electrical noise and time constants of the programmable moving average digital filter. The unit's serial data output is accurate to ±0.01% of reading ±2 counts in ratiometric load cell mode and ±0.01% of full scale in ±2 counts in absolute microvolt meter mode. 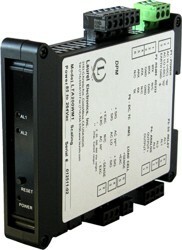 Fast read rate at up to 50 or 60 conversions per second while integrating the signal over a full power line cycle are ideal for peak or valley capture and for real-time computer interface and control. Specify min signal and displayed reading, max signal and displayed reading.